If you’ve ever done anything outdoors, chances are you’ve needed a knife at some point or another. Your knife is your most invaluable tool; it’s the tool that can build your shelter, prepare your meals, process wood for a camp fire, cut your fishing line, and even get you out of a survival situation you didn’t expect to be in. Having a good quality knife can make your camp site tasks easy and enjoyable. Choosing the right knife for you can be really confusing and there are a lot of misconceptions about brand quality and the reliability of a cheap knife. I’m going to break down everything you need to consider when purchasing a knife and how to choose the one that will work for you the best. 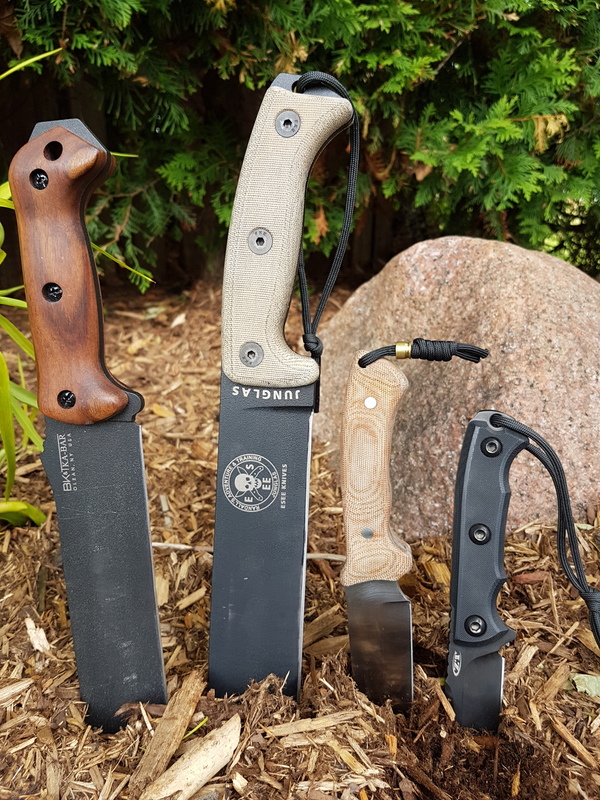 This article will focus primarily on fixed blade knives as they offer unmatched strength, comfort in the hand, and ease of use when camping. When looking for a new knife there are four main things that I consider before I make my purchase. They are (in order): Purpose of use, blade steel, size, and warranty/company reliability. What will you be using this knife for and what can you expect from it? Will you be using it to replace your hatchet and process heavy wood? Will you use your knife exclusively as a camp kitchen knife? Or will it be used for a little bit of everything? The purpose of use is the most important thing to consider before you even start doing your research into which knife to buy. It’s important to understand the limitations that different knife designs have. If your knife is going to be splitting logs and de-limbing trees, you’re going to want a knife with a blade no sorter then 8 inches, have a blade stock (thickness) of 3/16ths of an inch and a nice carbon steel that can flex without snapping or shattering under the heavy abuse. On the other hand, that knife will be way to thick and bulky for any sort of fine work like whittling or chopping up vegetables for dinner. Once you have decided what you will be using your knife for, you can start narrowing down your options. The heart of every knife is its blade steel. A good blade steel will stay sharp, take a wicked sharp edge, and perform well above any cheap quality no name “stainless steel”. Choosing a knife with the right blade steel is very important after deciding what your knife will be used for. You are presented with two broad categories of blade steels, stainless steels and non-stainless carbon steels. Both types of steels have advantages and disadvantages that make them useful in different scenarios. Stainless steels contain high amounts chromium which give them the ability to resist rust and corrosion much better then carbon steels, although they can still rust if not wiped dry or maintained. These steels can be hardened to a high Rockwell hardness which gives them excellent edge retention. The fatal flaw of stainless steels is because of their high Rockwell hardness, the steel can catastrophically shatter if twisted or bent with a slight amount of force. Stainless steels are used in 95% of modern folding knives and small fixed blade knives. Carbon steels are ideal when considering any knife that will be used for any sort of hard work like wood processing, chopping, carving, and whittling. They are heat treated to lower Rockwell hardnesses then stainless steels and won’t hold that sharp edge as quite as long, but they will flex to extreme angles before shattering and are extremely easy to sharpen back to a hair shaving sharpness. Carbon steels are considered the holy grail of survival/bushcraft knives. A few examples of good, high quality, stainless steels you might come across are S30V, 154CM,VG10/VG1, and S35VN. A few good quality carbon steels to consider are 1095 (my personal favourite), 1084, and 1075. So what does this all mean? If you plan on using your knife to do small, light tasks like cutting food or fishing line, a stainless steel blade will be a lot less maintenance and will stay sharp for those delicate tasks. If you plan on chopping wood, taking branches off dead tree limbs, or making impromptu shelters, a carbon steel is going to be your best friend. The size of your blade can make a task easy or extremely difficult if chosen incorrectly. This category heavily relies on personal preference. In my experience, a 6 inch blade length is the perfect balance between being big enough to tackle hard tasks, small enough to still prepare meals, easy to carry on your belt, and easy to store in my pack when not in use. A small fixed blade like an ESEE Izula is extremely portable and light, but lacks the size to process wood efficiently. The thickness of the blade is also something to consider. I have found that 3/16ths of an inch is perfect for almost any task but a thinner blade stock for lighter work is definitely good as well as the knife will have an easier time slicing. I’ve used many fixed blade knives and I have found a few companies have really stood out in terms of product quality and customer service. ESEE knives is the be-all end-all of production fixed blades in my opinion. Ergonomic handles, outstanding materials, and the absolute best warranty in the business. If you break an ESEE knife, even if you shoot a hole through it, they will replace it with a brand new one free of charge. KABAR knives is another fantastic company with excellent value for your money products. The KABAR/Ethan Becker collaboration series of knives uses similar materials to ESEE but for a fraction of the price. Their warranty includes a lifetime guarantee on materials and workmanship, so if you break it under normal use, they will replace it at no extra charge to you. Lastly, I want to give an honourable mention to Morakniv of Sweden. These $20 knives can take a beating and even though I have yet to break one, at the price point, you can buy 5 or 6 for what an ESEE will cost you. That being said, I would always recommend an ESEE if you have the cash to drop on one, they are truly fantastic and indestructible knives.